ROUTE 66 is long .... but I promise, the Old Man will stay the course and meet you in Las Vegas!!! WE MADE IT IN LAS VEGAS ... SAFE! 2,500 miles / 4,000 km in two weeks!!! One more accomplishment for the REFUGEE ....!! Looking forward to our dinner Tuesday! Grand Canyon, Arizona - Kingman, Arizona 223 miles/ 350 km. ... ON SCHEDULE. Beautiful sunny day .... Amazing scenery of the Grand Canyon .... nice ride with few stops. Flagstaff, Arizona - Grad Canyon, Arizona 148 miles/238 km ... ON SCHEDULE! Unbelievable .... The Old Man did over 2,000 miles/3,200 km .... (I will tell you at the Birthday dinner Why I did it)! Many small roads and interesting beautiful scenery .... and very impressive Grand Canyon !!! Gallup, New Mexico - Flagstaff, Arizona 228 miles/366km ... ON SCHEDULE! Sunny - Beautiful day and lots of visits along Route 66 ... Pictures and Clips should be very interesting for you! Albuquerque, New Mexico - Gallup, New Mexico 183 miles/300 km. Our third biker is with us and we are OK with our schedule. Albuquerque, New Mexico Lazy SUNDAY .... Picked up one rental Motorcycle for the French couple and getting ready for the last one third of the road to Las Vegas: about 600 miles/1,000 km left ! Pizza night (with some red wine - not coca cola) in front of the TV watching the second USA Presidential Debate. Albuquerque, New Mexico .... Day off to wash car, motorcycle, catch up on email and ticklers!! Waiting for our friends from France. 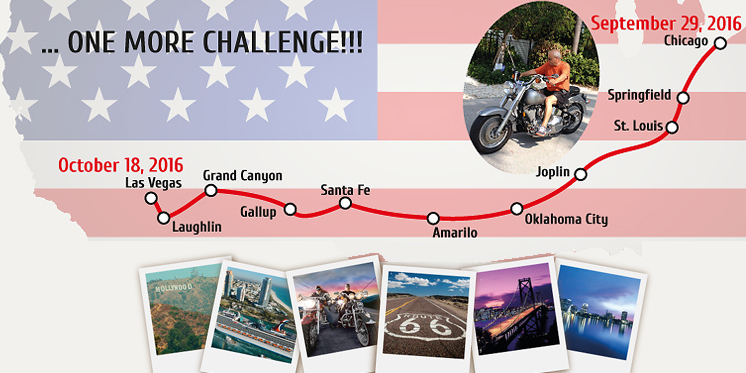 Santa Fe, New Mexico - Albuquerque, New Mexico 68 miles/110 km., short ride .... ON SCHEDULE! Some sightseeing and email/computer work. Moved close to the airport in Albuquerque where one more French couple will join us. They are flying in from France and arriving tomorrow. Amarillo Texas - Santa Fe New Mexico, 287 miles/460 km., our daily record .... AHEAD OF SCHEDULE! What a day - Longest day and we climbed to the 7,000 Feet/2,100 meters where Santa Fe is situated! Weather went from 28 degrees to 17 Celsius in few hours .... Lots of desert wind. The Old Man is keeping with the pressure!! Elk City, Oklahoma - Amarillo, Texas 187 miles/301 km ....ON SCHEDULE! Sunny and a beautiful day for riding, no traffic and a short day trying to catch up on emails. Will get a big Texas steak tonight. Tulsa, Oklahoma - Elk City, Oklahoma 233 miles/378 km ....ON SCHEDULE! Cannot believe The Old Man did 1,000 miles/ 1,000 km on a motorcycle!!! Lebanon, Missouri - Tulsa, Oklahoma 253 miles/408 km ..... WE ARE AHEAD OF SCHEDULE! Longer drive on small roads and few more stops. I am getting better with handling of the motorcycle! No rain, some sun, wormer but a lot of traffic for a Sunday! Five and one half hours, traffic and rain all the way with the sun coming as we arrived!